There is an abundance of nourishing and tasty food in Hida-Kanayama. 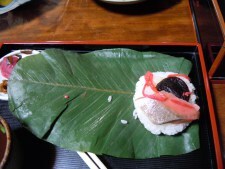 Here is an example of a Hida meal. Most of the food is produced locally, from mountain vegetables to mushrooms (hijiri in photo), hoba miso (small dish on the right), soba noodles (lower right corner), to the tender Hida gyu beef. Ice cream is also delicious here, made with the cream from Hida cows. Shown below is the famous Hida sushi. It is wrapped in the hoba leaf, and it is convenient for picnics and for traveling. The dried hoba leaf is used for broiling food (not visible on the burner on the upper right of the above photo). The leaf will not burn while there is still food (or hoba miso) on it. The hoba (magnolia) tree grows at the Kanayama Megalith site. Come to Kanayama and enjoy the foods of nature! This entry was posted in Uncategorized on 2015-09-11 by Okunomichi. Kanayama was absolutely gorgeous in May this year. The “ten-ten-ten” spotko (dash-dash-dash spotlight) showed up just as expected, although a bit tardy since this is leap-year. Here we show photos taken by me, Iwaya Rockbat, on May 21 and 22. We see the triangular face of the cut stone in the grotto of Stone A before and after the sunlight strikes it. We can see how the sunlight slants along the southern face at right angles to the triangular face. And finally, we see the five spots. ST’s hand points to the topmost spot, which is pretty faint in the photo. By taking a close look at the photo without the spots, we can understand that the surface has been deliberately carved with “bumps” which catch sunlight, creating dashed spotlights. Just remarkable, the ingenuity of the ancient megalith builders! 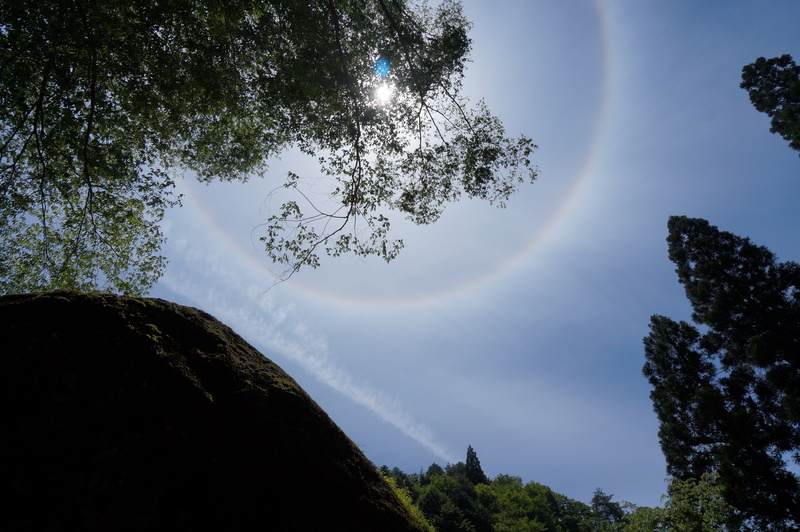 On May 22, people in Japan and elsewhere (such as in Mexico City on their May 21) were delighted to observe a striking sunbow. 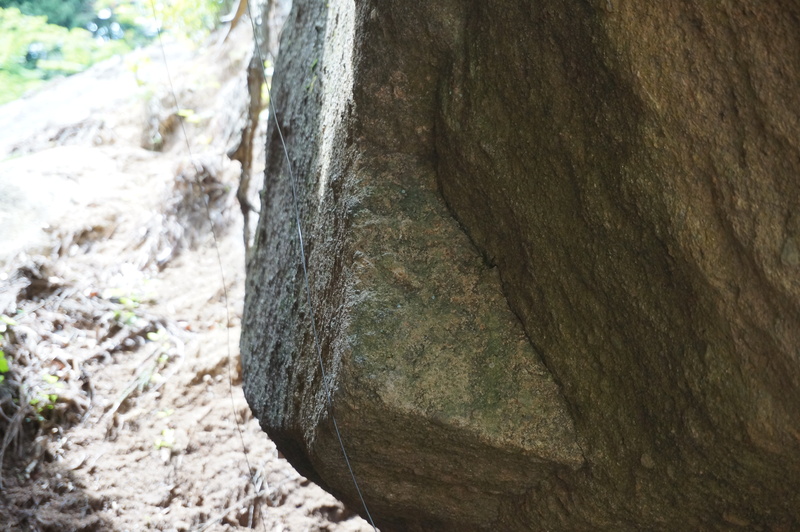 Here are some photos taken of the sun above Kanayama Megaliths. This entry was posted in Uncategorized on 2015-09-02 by Okunomichi. Earlier, we told about Chinjyu-san, the hill in Kanayama Town where Ryoumen Sukuna prayed. Here are two more photos by Shiho Tokuda, taken in June 2015. 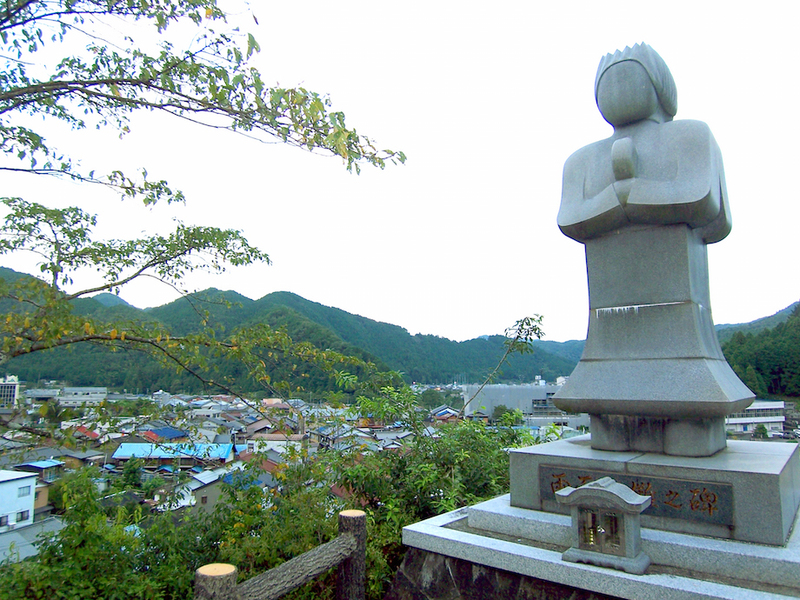 One shows the view of the statue overlooking Kanayama town. 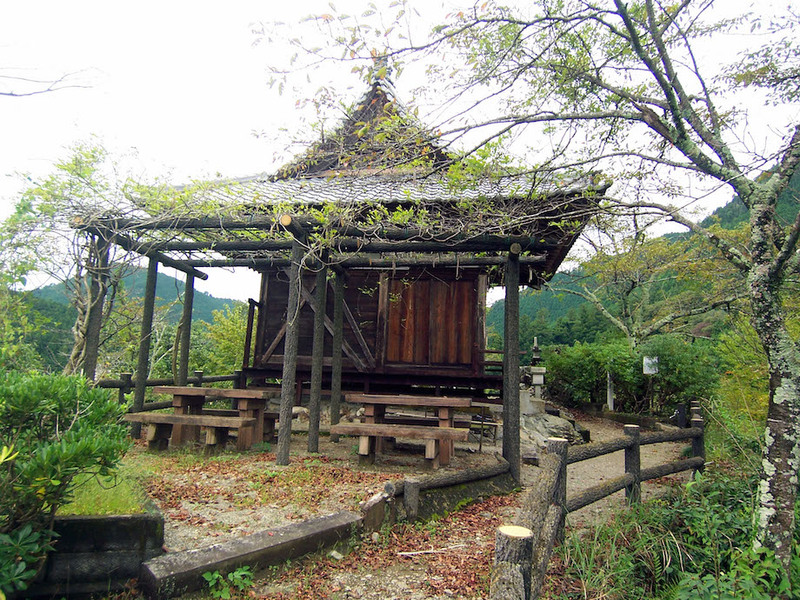 The other is the little temple-shrine of Chinjyu-san with an arbor and seating. It certainly is peaceful there.